It’s only a matter of days before the day when all couples celebrate their love. 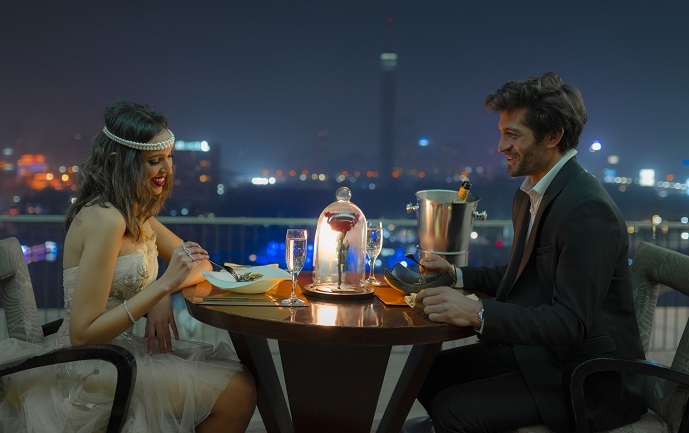 If you still have no plans for Valentine’s Day, Cairo’s luxury hotel The Nile Ritz Carlton has what it takes to impress your special someone. The hotel’s rooftop restaurant and bar, Nox, welcomes you and your loved one to enjoy Valentine’s Wonderland; a night where romance fills the air as the DJ takes to decks to play famous love songs before a surprise act takes over. The night also sees an array of delightful bites and cocktails served. If that doesn’t seem enough for you, take it up another notch and make your reservation at Nox’s terrace, where only ten lucky couples will get to enjoy the area’s romantic and intimate ambience that boasts an equally enchanting view of the Nile and Cairo. This special celebration comes with a bottle of Moet & Chandon and a 5-course candlelit dinner. Also, there will be a professional photographer, who will be close on hand to capture the blissful moments. Follow this romantic dinner with some quality time at the hotel’s spa, where you can enjoy a range of romantic-themed treatments including the rose body scrub, or a relaxing 90-minute massage session using rose body butter. And why go home, when you can spend the night at the hotel? When you dine at any of The Nile Ritz-Carlton’s Bar’oro, Nox, or The Rooftop, you get 10% savings on the best available rate. For more information, call 02-25778899, or email rc.cairz.reservations@ritzcarlton.com.